ePosters - You’ve collected messy crowd-sourced data – now what? 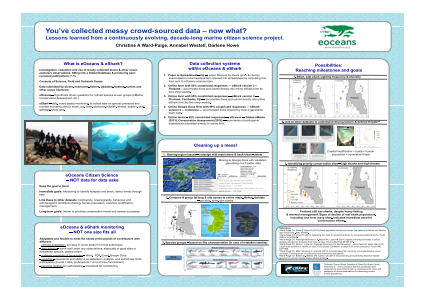 Poster Title: You’ve collected messy crowd-sourced data – now what? Abstract: Marine ecosystems are undergoing massive transformation due to the effects of multiple human stressors. Action to protect what is left has been slow for many reasons, such as inadequate administrative capacities or stakeholder pushback, but a lack of data often supports inaction. Recent technological advancements and interdisciplinary collaborations have increased what is known. But the ocean is vast, and there are many data gaps. Projects that crowd-source data are increasingly being used to study marine ecosystems, and have the potential to fill some of these gaps. For example, eShark-Thailand (eOceans.org) has >13,000 records (>10,000 hours) submitted by divers on 185 sites, including encounters with sharks, rays, jellyfish, turtles, seahorses, etc. The problem, however, is that these data are messy: sites are not randomly assigned, effort is not standardized, contributors have varying experience, and species identification is not trivial. But, do these issues negate their value? Here, we present insights from a decade of lessons learned, and assert that crowd-sourced data can be valuable, if: the survey and database are compact and statistically robust with validation in mind; strong two-way relationships are made with outreach and field teams; and there is feedback from participants when interpreting results. We further demonstrate the value of these data through a marine spatial planning exercise using eShark-Thailand, where we investigate the hotspots and drivers of elasmobranch diversity and abundance, and overlay threats to delineate priority conservation areas.Summary: We summarize different data collection systems used by eOceans citizen science teams, show some of the ways these need to be standardized, and give an example of how we treat and use them to identify conservation priorities in data-poor areas. References: 1. Ward-Paige CA, Davis B, Worm B (2013) Global population trends and human use patterns of Manta and Mobula rays. PLoS One . 8(9): e74835. 2. Ward-Paige CA, Lotze HK (2011) Assessing the value of recreational divers for censusing elasmobranchs. PLoS ONE 6(10):e25609. 3. Ward-Paige CA, Pattengill-Semmens CV, Myers RA, Lotze HK (2011) Spatial and temporal trends in yellow stingray abundance: evidence from diver surveys. Environ Biol Fish 90:263-276. 4. Ward-Paige CA, Mora C, Lotze HK, Pattengill-Semmens CV, McClenachan L, Arias-Castro E, Myers RA (2010) Large-scale absence of sharks on reefs in the greater-Caribbean: a footprint of human pressures. PLoS ONE 5:e11968. 5. Ward-Paige CA, Mills Flemming J, Lotze HK (2010) Overestimating fish counts by non-instantaneous visual censuses: Consequences for population and community descriptions.